As part of the North Face Locals Ambassador program they send athletes a box of products to try each year. This year when I received it I was living in Colorado. It doesn’t rain as much as it does there as it does here in New Hampshire where I now live so I didn’t get much of chance to try rain hear. Now, I wear the Women’s Isotherm jacket almost every run and it’s my go-to running jacket to stay warm and dry. 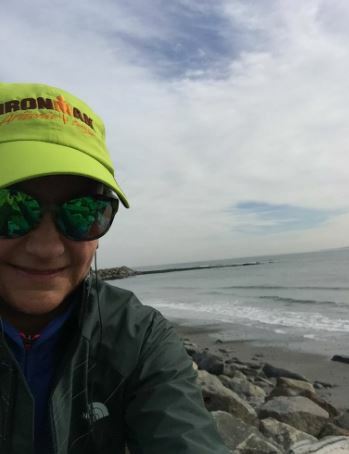 Here’s me in my jacket in February when I ran a loop near Rye Beach. The jacket has always kept me dry and warm. I’ve been running in all kinds of weather: wind, rain, misty rain, rain and wind and earlier in March snow. With all the rain and cold temperatures, I wear this jacket, a long sleeve shirt, running tights and I’m good for any distance. This morning, Tuesday, May 9, 2017 it is 32 degrees. I will be adding a beanie and gloves. 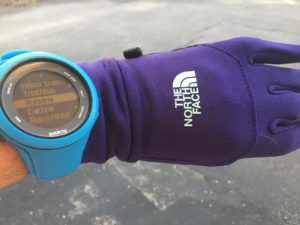 I’m a bit biased when it comes to The North Face products because I’ve tried so many of their winter jackets, running tights, hats, vests and backpacks. The products have never let me down and I’m proud to be an ambassador. It rained a lot. Ha. I’m still trying to get used to the constant rain. My new running training plan continues to September 4 and the 53K race in Vermont. I hope to add more races during the next four months. I spent a few hours tonight looking at races including a marathon on Killington trails and a local 10 miler. Saturday, I ran 6 trail miles in the Winant Trails area and Sunday I ran 4 road miles. I didn’t swim, bike or do yoga which will be included in following weekends. I’m including more core and stretching after running. As part of the training plan there will be hiking – a lot of hiking. Hiking was a major component of my trail marathon training when I raced The North Face Endurance Challenge – Utah in Park City last fall. The race had a lot of climbing, and the hiking paid off. This year with Jay Peak as my A race there must be long trail runs and long hikes. Also, this weekend, I noticed the blackflies are out. UGH. I have not missed those buggers when I lived out west. Annoying! 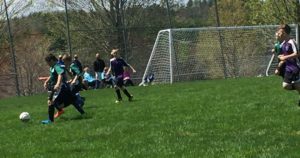 I did get to see my nephew, Zeke play soccer. He’s such a star! I’m looking forward to this week and getting more into a routine ­­­with increasing mileage and sticking to the training plan. After living in Colorado and Arizona for the last 13 years I never needed rain boots. 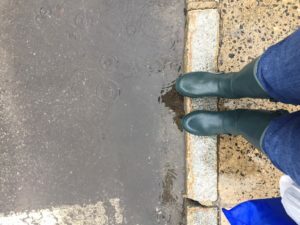 After moving back to New Hampshire in February and several continuous days of rain it was time to buy rain boots. I bought these LL Bean Wellies by chance at the LL Bean Outlet in North Hampton. With rain in the forecast for the next four days, they have become an essential. Walking home from work on Friday, May 5 – in the rain. 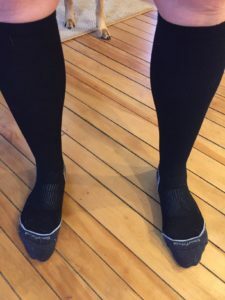 Speaking of taking care of your feet, after this morning’s run I remembered that I should wear my compression socks to aid recovery from the street pounding. I’m a big fan of Smartwool. My socks are the Standup Graduated Compression Socks. I don’t wear them as much as I should so these I’ve had for about two years and still hold up; meaning they really help soreness. I’m glad I put them on this morning, and wore them all day at work, because I don’t feel so sore tonight. I’m slowly building mileage for my A Race – Jay Peak Trail Running Festival in September. I’m signed up for the 53.1k Ultra. I’ve finished a 50K in February 2013 and had a DNF during a 50K in November 2014. I’m ready to try again. This blog is about ultra running in New Hampshire although I’ll be racing around New England. I was signed up for a 50 Mile race in Arizona in March 2017 and deferred to 2018 so I have an even bigger race next year. The reason I started this blog is to write about ultra running as I get older and to share tips and strategies for training and nutrition. I’m 46 and started running and racing triathlon over 10 years ago. It’s harder to recover now, yet I still have ambitious goals for racing and competition. Racing is a relative term: I’m not fast. I like competition and finishing races in new places. I rarely raced the same event twice. Thank you for reading and please come back again.